ceasing to gossip. The reasons: they lack trust, skills, confidence, or compassionate understanding. Ah… Gossip’s not called “juicy” for nothing! Most people agree gossip’s not healthy or helpful and that it’s everywhere! It’s in businesses, schools, homes, even churches! There’s good reason for this. And, in order to build trust and teamwork, gossip needs to go. The question is: how and what would allow people to find something more satisfying instead? I’m Judy Ryan, a Human Systems expert and I work with organizations, helping them understand the good reasons people gossip so they can incorporate new strategies to meet needs met by gossip, by substituting more satisfying practices instead. lack trust, skills, confidence, shame nor a compassionate understanding of why there’s such a pull to gossip. 1) To feel empowered. Stress in relationships often triggers feelings of overwhelm and the belief we’re not empowered. To combat this, gossip gives a false sense of power; pseudo-power. Gossip then provides the illusion we’re taking meaningful action when, in fact, we’re avoiding it. 2) To feel lovable. We often have faulty interpretations of negative behavior from others, become triggered by self-doubt and insecurity, and conclude we’re not lovable. Gossip pro- vides temporary relief as we inflate our own virtues and exaggerate the faults of others. 3) To feel contributing. We gossip to compensate for times we’re not giving, doing or saying what would otherwise fulfill us and be aligned with our values, either because we feel too afraid, unclear, unable and unwilling to take action. 4) To feel connected. Especially in the US, many people report they experience inadequate physical and emotional connection. Gossip, unfortunately, is a widely sanctioned way to intensely connect as opposed to more vulnerable expressions of appreciation, encouragement and love often disdained as too mushy or touchy-feely. 5) “Don’t we just need to vent?” Venting can be helpful but not the way it’s normally done. 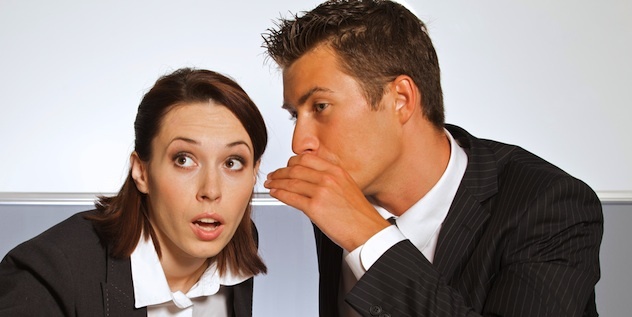 Gossip as venting is just another way to create the feeling of meaningful action. And indiscriminate, unfocused venting hurts: the one giving it, the one receiving it and the one gossiped about. When venting is handled with an intention to take constructive action and greater personal responsibility, everyone wins, everyone feels empowered and lovable, and you have the satisfaction that comes from creating an intensely positive, powerful connection, which is a fulfilling alternative. So if you find yourself in the habit of gossiping, stop and remember these five good reasons people gossip. If you want, you can then learn how to gracefully shift from gossip into something more constructive.